I pulled Harris’ overflowing train molded cake pan out of the oven precisely at 3:30 p.m. and put the bowl containing Barron’s yellow cake mix in at 350 degrees for 42 minutes. As I drove to Alpharetta for yet another weekend work commitment, guilt pursued me like a Lilburn cop after someone who entered the turn lane too soon (not that I would know anything about that.) For the third weekend in a row, I had to leave my family to do my job. Perspective can be illusive when guilt surfaces. I really don’t have to work on the weekend that much. I enjoy my job. Each of the last three weeks has offered enjoyable engagement with good people and meaningful times of worship. I am extremely involved in my children’s lives and show up most every time there is something to show up for. So why did I feel so guilty? 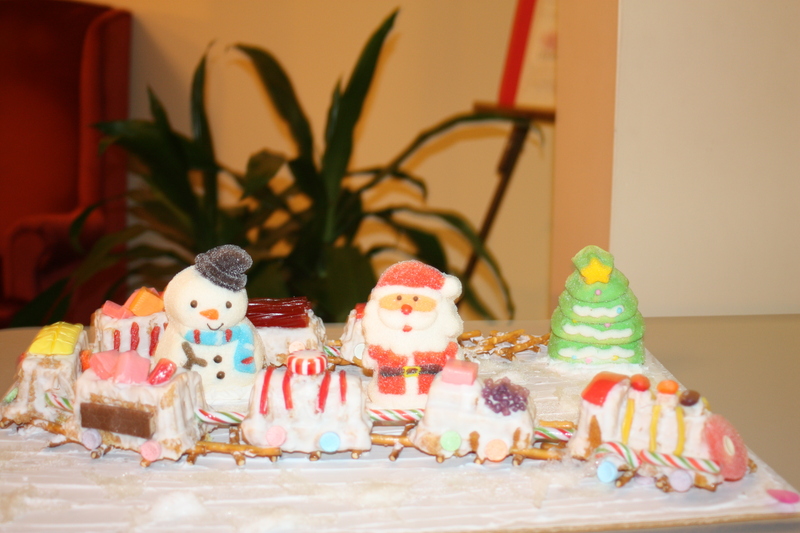 All aboard Harris' Christmas Train Cake express. Next stop... first place! 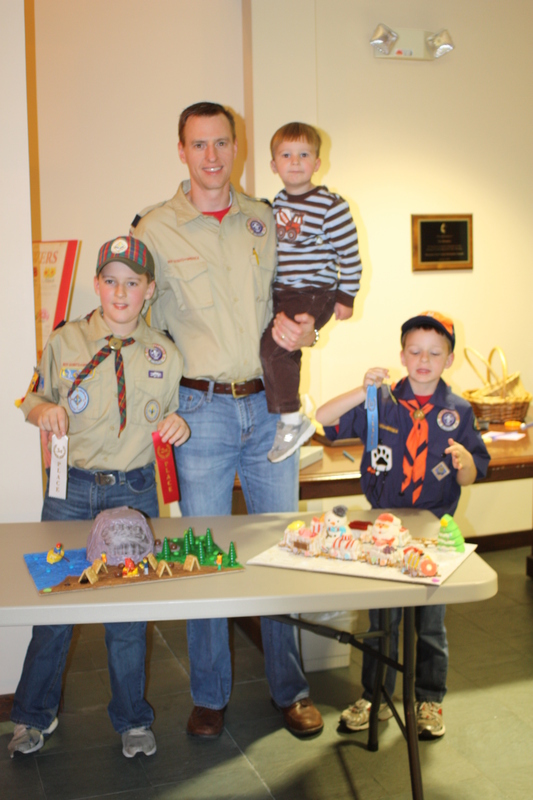 I was bailing mid-cake bake on what was supposed to be our father-son bonding time as we prepared our entries for the annual Cub Scout pack Dad & Lad Cake Bakeoff. The competition is designed to get boys and their “non-cooking” parents to spend time together in the kitchen. Cake Boss I am not, but whipping up the batter from the box and putting it into the oven I can handle. That’s all I was able to do Sunday, and when I got home at nearly 11 p.m. that night, I studied Harris’ fully-decorated Christmas train cake with a mix of emotions. 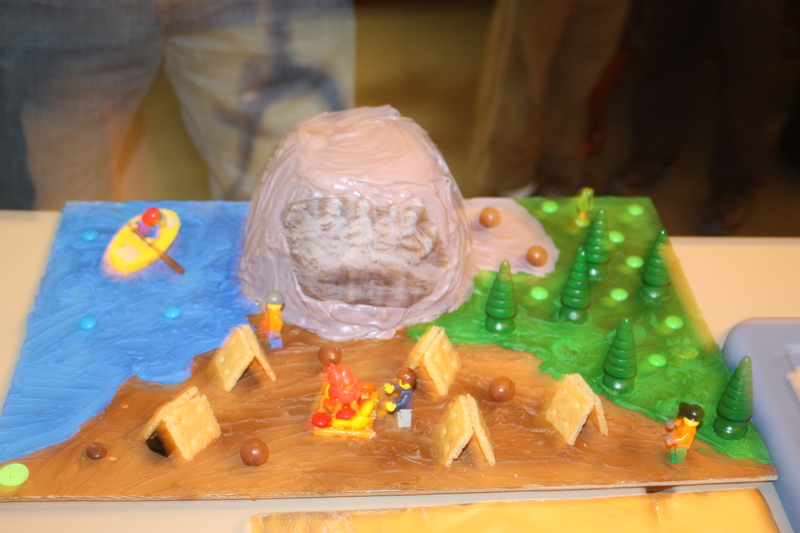 Not all components of the Stone Mountain Campout Cake are edible, but the mountain itself was mighty tasty! Monday night was my chance at redemption. Barron’s cake was still unadorned, so together we mixed up batches of icing in appetizing colors like granite gray and grass green to re-create our recent campout at Stone Mountain Park. We printed off a picture of the carving of Stonewall Jackson, Robert E. Lee and Jefferson Davis, and while Barron carefully applied it to the big gray-covered, bowl-cooked cake, we discussed what he was learning about the Civil War. Those were the moments the competition was designed to induce. Tuesday night as Barron collected his second place ribbon for the scouting category and then the overall “Cubmaster’s Choice” award, I watched him suppress a smile as he stood on the platform. I was more anxious than an Oscar-nominee waiting for the envelope to be opened when the Cubmaster got to the holiday category. Harris wasn’t called for third place or second, and not having seen the competition, I was worried that Harris might go home empty handed. But sure enough, Harris won first place. As I tucked them into bed that night, I was grateful that my times away are infrequent, my boys are creative, we enjoy spending time together and success as a parent isn’t measured in blue ribbons. This entry was posted in Uncategorized and tagged baking, Boy Scouts of America, cake ideas, cakes, Cub Scouts, dad and lad cake bakeoff, Lance Elliott Wallace, Lance Wallace, Lilburn, New South, New South Essays, NewSouth, parenting, Southern Culture, Southern Living, the South. Bookmark the permalink.